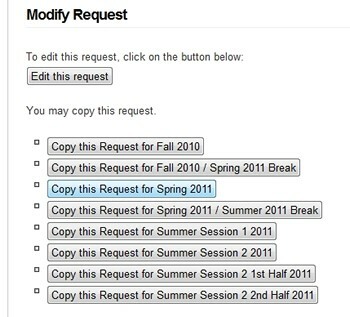 Detailed below are the instructions on how to copy requests to a new term in the ATLAS Scheduler app. If you follow these instructions, but it seems like options are missing or that the app isn’t working, it may be a technical issue. Email ATLAS at atlas-apps@illinois.edu for additional support if the guidelines below don’t answer your question(s). Next: Hover over the “Requests” tab in the upper left-hand corner and click “View Existing Requests”. Locate the request you wish to copy and click “View Request” on the right. Under the Modify Request heading (middle of the page) there are several copying options available. 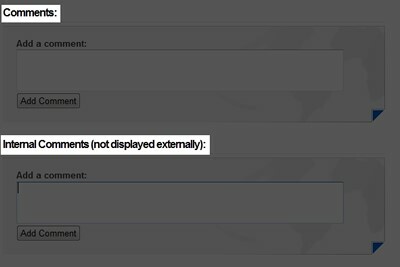 Choose the desired term and click “Copy this Request for [Term Name]”. This opens the Create New Request page. The process will be similar to creating a new request, but the majority of information will already be filled in. Check to ensure information is correct at each page before clicking “Next”. Any changes will only affect the copied request, not the original. 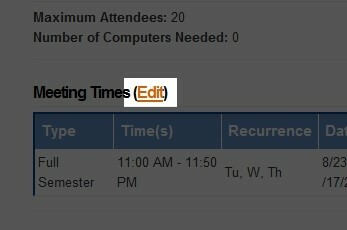 Add or remove associated people if instructors/teaching assistants/etc. have changed. Add or remove resources if necessary. Fill in information for the Additional Information and Comments pages. Information from the previous term will not be copied over for these pages.